Card Talk is AWESOME! 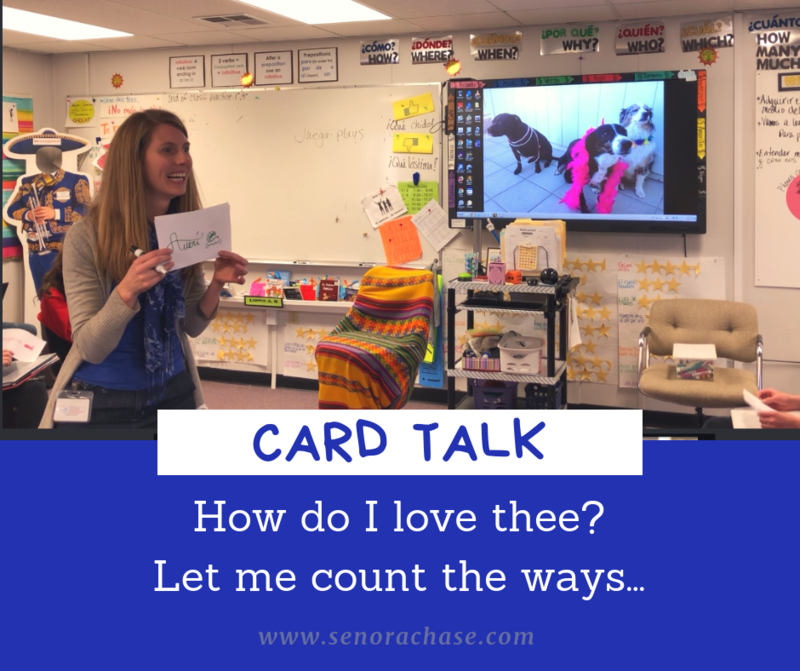 If you’re new to Teaching with Comprehensible Input or considering taking the plunge, Card Talk would be an excellent first step. It’s super easy, requires NO PREP, and is a natural way to chat with kids about the things they like. Little known but interesting fact…Card Talk used to be called Circling with Balls way back in the day. Someone thought the name needed updating but I prefer the original. It makes me laugh every time. If you had a zillion dollars, what would you do? What are you going to do over Summer Vacation? Then the students show their cards and the teacher facilitates conversation, using the illustrations. Pick a card, show it to the class. Ask questions, write any new words on the board in your target language and English. Make comparisons between cards. As the class their opinion. You can go as long or as short as you like…I generally go until they get antsy, then I collect the cards and move onto something else. Sometimes we’ll revisit the cards another class, sometimes not. Don’t feel like you’ve got to talk about everyone’s cards… Watch your kiddos, as long as they’re still into it, keep going. If they’re getting bored, don’t keep dragging them along! Wanna see? This is one of my Spanish 1 classes and I asked them to draw what they like to do…there’s a lot of sports vocab (hence the original name, Circling with Balls!). NO PREP! All you have to do is think to yourself, “Let’s do Card Talk…What do I want to talk about?” and that’s it. My favorite Lesson Planning Activities are the ones that give me lots of good, rich input for ZERO prep time! Score! You can talk about Anything! Card Talk is especially great if you’re following a textbook or thematic units. You can start any unit with Card Talk as a way to introduce the high frequency vocab. Card Talk works for all levels…you can do Card Talk on Day 1 of Level 1 all the way to AP. Because you give them the prompt, you guide where the conversation goes, and since they draw a picture, it helps to keep the conversation comprehensible, so you can go far and wide with it! Let your Grammar Freak Flag Fly. Secretly we are all grammar freaks…we became language teachers, after all! Card Talk is a sneaky way to target the grammar you want to expose them to. Wanna get fancy with the Subjunctive? Have them draw what they want their parents to do. Want to introduce them to the conditional? Ask them to draw the laws they would implement if they were King of the World. Imperfect! Plucomperfecto! Knock yourself out! Just think about a prompt that would lend itself to talking naturally using that tense you want to target. Easy peasy! What’s in a NAME? True confessions: I’m really pretty horrible at remembering students’ names. Like, if I had a Teacher IEP, I’d request the accommodation that all students will reintroduce themselves to me every day on their way into the classroom, and especially when they’re not in class, but see me around campus or in the grocery store, gas station, etc. I’ve had to develop some serious coping strategies and one of them is Card Talk after every break! They think it’s so we can just talk about their fabulous vacations…really it’s so I can remember all their names again!! I am not even a little bit joking here. Some people aren’t into the crazy, outlandish brand of stories and characters that are sometimes associated with CI or TPRS… I love Card Talk because it’s real. It’s talking to them about the things they care about. Put everything else aside and really listen to your students. Get to know them and you create this Magic Little Happy Town where kids come alive and acquire language without even trying. And, did I mention, it’s NO PREP! Which means, there’s really no reason NOT to try Card Talk tomorrow in class! Try it! Do it! Great way to present structures in context relating to sts life. I’ll try it. Thank you for sharing!! Thank you very much for sharing. I’m getting into CI and your card talk prompts help me a lot. Actually, this is my first week of school and I’m looking for ways of assessing their speaking level in English (I teach EFL/ESL). This is a good strategy to do that.